The periscopes of the historic HMS Alliance were returned by a giant crane today as part of a £7m conservation project to restore the only surviving WW2 era A-class submarine sited at the Royal Navy Submarine Museum in Gosport, Hampshire. The periscopes have been conserved by the Babcock International Group at the submarine base Faslane in Scotland. HMS Alliance was equipped with two 40ft periscopes, one for general use and one for attack. The Attack scope is made of bronze and dates from the submarine’s construction in 1945. Both periscopes were removed last year for restoration. The returned periscopes will be fully functional and allow visitors to HMS Alliance, the opportunity to view Portsmouth Harbour where the historic submarine is based. 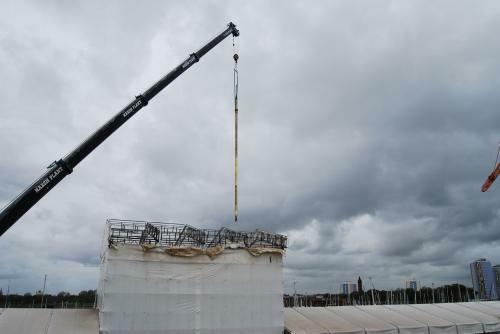 The Museum’s restoration contractor ML UK Ltd, based in Portsmouth, will be using two large cranes to re position the historic periscopes. The periscopes will then be set for the best view in elevation and power. The conservation project to restore HMS Alliance will be completed in Spring 2014, meanwhile the Submarine Museum is open to visitors, however HMS Alliance will be temporarily closed while the periscopes are refitted. HMS Alliance will reopen Tuesday 21 May. This entry was posted in UK Submarines and tagged Gosport, HMS Alliance, Royal Navy Submarine Museum on May 15, 2013 by jasonlockley.